Bake a large round or large square cake. Draw on the cake using an icing filled bag and round tip #5. 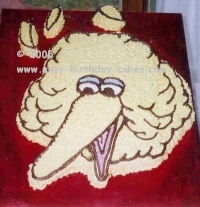 The tip of Big Bird's beak and three feathers are made from pieces of cake left after you cut out the outline. Refer to the above picture as a guideline. The mouth is done in pink icing. Cover the remaining cake with yellow icing including the three feathers above his head. The eyes are done in white and black icing using star tip #18. Star tip #18 is used for the rest of the cake. The eyelids are done first with a blue strip of icing then a pink strip of icing. Outline him in black icing with round tip size #5 using the picture as your guideline. You can write a birthday message on the board if you would like, so you do not have to put it on the cake itself.